Picture the scene… An exquisite penthouse-level rooftop Sky Bar, unobstructed views of London’s incredible city skyline and St Paul’s Cathedral, an anxious soon to be Mum and Dad surrounded by over 100 family and friends all waiting to hear if their expected baby is going to be a boy or a girl; and 2 huge confetti cannons primed and ready to go. That’s what Confetti Magic were asked to be part of recently. We had a call from expectant Mum and Dad, Liz and Tony who were planning a gender reveal party for their family and friends. They wanted the reveal to be something special with a big “wow” moment, so of course, we were delighted to help make the moment memorable for them. We took along two of our big CO2 Stadium Blasters, each filled with 5kg of confetti. 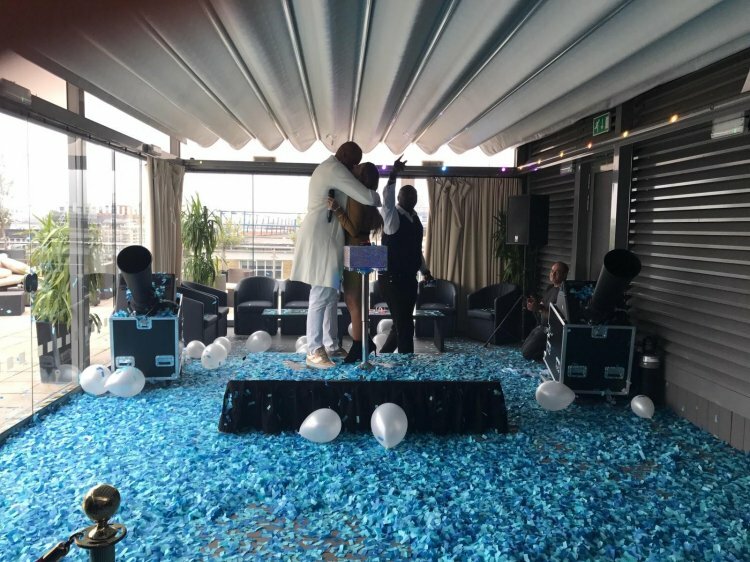 Amazingly, the reveal was to be a surprise for the parents as well as the guests, so after some super-secret phone calls, it was critical that we kept the confetti colour hidden and under wraps. To add to the moment, we provided a new light-up VIP button and programmed the LEDs to flash the appropriate colour when pressed. Now available to hire, our LED VIP button is another way of adding some sparkle to that special moment. At the end of the countdown the button was pressed, flashed blue and a huge cloud of light and dark blue confetti filled the room. It’s a BOY! The official video of Liz and Tony’s special gender reveal can be seen here. If you are planning a gender reveal party and want to make the moment memorable, then give us a call to discuss your ideas.